The frontrunner in the French presidential election, Nicolas Sarkozy, has said France is "exasperated by uncontrolled immigration". Mr Sarkozy, of the centre-right UMP party, put the "national identity dispute" centre-stage on Monday. A riot in Paris last week sparked by the arrest of a Congolese man fuelled debate about immigration and security. 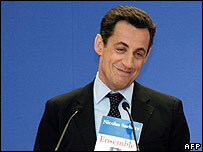 Mr Sarkozy recently resigned as interior minister to concentrate on his campaign for the 22 April election. "What exasperates France?" Mr Sarkozy asked at a news conference on Monday. "France is exasperated by the dispute about national identity, by uncontrolled immigration, by fraud, by waste". He said there was "an obvious link between 30 or 40 years of a policy of uncontrolled immigration and the social explosion in French cities". On Sunday Mr Sarkozy, himself the son of a Hungarian immigrant, accused his main rival, Socialist candidate Segolene Royal, of "hysteria" over her reaction to his comments on immigration and national identity. Ms Royal replied on the French channel TV5 by calling his comments "contemptuous, shocking and humiliating". "Does that mean that if Mr Sarkozy were elected tomorrow he would start insulting the other heads of state and government who disagree with him?" she said. Mr Sarkozy has called controversially for the creation of a ministry of "immigration and national identity". The fighting between youths and police at the Gare du Nord railway station in Paris last week revived memories of the three weeks of rioting that rocked French cities in 2005, involving mainly youths of Arab and African origin. The youths - many of them living in deprived suburbs with high unemployment - accused the authorities of racial discrimination. Mr Sarkozy said on Sunday that the French people would not show solidarity with rioters, accusing the Socialists of leniency towards them. Many respondents in a recent opinion poll said relations between the police and citizens had deteriorated in the past five years. Mr Sarkozy was interior minister for much of that period, and the IFOP poll showed 43% still trusting him to protect people and goods, compared to 15% supporting Ms Royal. A second-round runoff between Mr Sarkozy and Ms Royal still looks the most likely outcome. Opinion polls for the 22 April election give a slight advantage to Mr Sarkozy. Centrist candidate Francois Bayrou, the surprise of the campaign in March, has slipped in the polls below 20%. Far-right leader Jean-Marie Le Pen has seen his support nudge towards 15%. Mr Le Pen, who is running for the fifth time for president, has tended to gain from rows over immigration and security. What now for Nicolas Sarkozy? 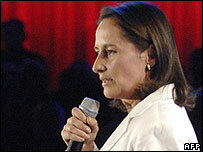 Segolene Royal - "Desirs d'avenir"